Nickel-O-Matic was designed to entertain and provides gratuitous mechanical motion rather than efficient production. Nickel-O-Matic uses inkjet technology to print a custom message on both sides of 1-1/2" diameter blank wooden nickels. 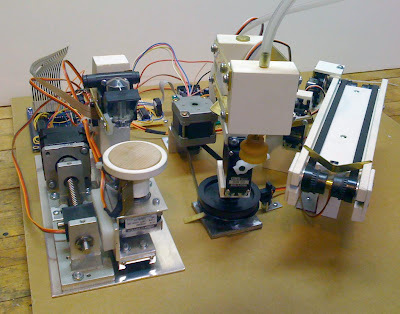 The robot uses a BASIC Stamp 2 to control much of the mechanical movement and a Propeller Chip to control the Inkjet system. The two controllers run a total of four hobby servos, three stepper motors, one DC motor, one DC vacuum pump, one inkjet head, and five IR sensors. Mike Davey, the designer, said that the system was built as a number of modules to make design and trouble shooting simpler. The most complex of the modules is the inkjet system. At the center of the inkjet module is a spindle that rotates the wooden nickel under the inkjet head. This spindle is turned with a stepper motor and allows for repeatable placement of the nickel under the inkjet head. The spindle is also moved horizontally under the inkjet head by a second stepper motor coupled to a lead screw and slide mechanism. A Propeller Chip controls all the elements of the inkjet module. The Propeller Chip was chosen for the inkjet system for two reasons. The first is that the inkjet required fast and accurate timing. The Propeller Chip has direct control over the inkjet head through a simple Darlington transistor array. Each of the inkjet's 12 nozzles needs pulsed on for no more than 6 microseconds. The second reason the Propeller Chip was chosen is that the module needed at least 24 IO pins to control the inkjet module. The inkjet head needs 12 pins, the two steppers need 4 pins each, there are three IR sensors, and I needed at least one pin to communicate with the BASIC Stamp 2.